Recently I returned from walking the Spanish Camino to the medieval town of Santiago de Compostella, the legendary resting place of the Apostle James. Returning pilgrims are faced with the same questions, I imagine: What did it mean? Has it changed you? Was it the significant spiritual experience that people speak about? Well, I must confess I'm not making a great fist of answering these friendly enquiries. By the time I clear my throat and fashion a few clunky words, there is often a slightly embarrassed gap and, often as not, I find the conversation has moved in some other direction. Let me try to make sense of the experience through the lens of one small story. About the half way point in the 350 km of my pilgrimage my companion and I were coming to the end of our walking day, looking forward to the evening's stop at a village called Alto de Poio. The map told us we were a few kilometres from our destination. A large house appeared on the track, with rows of washing on the line, a reliable sign that we had reached the refugio where we would find a dormitory full of exhausted pilgrims on their beds recovering from the six or seven hour walk of the morning. Taking the steps up to the verandah, we opened the front door and confidently walked into the house expecting the usual warm hospitality unfailingly offered to the weary pilgrim. Wham, bam, alakazam — a rather small ancient man barred our way and attacked us with a venom normally reserved for carriers of some ancient plague, shouting in a pitch beyond fury, snarling like an enraged guard dog. We retreated as though our backpacks were on fire. The householder's response was understandable, when you think about it. He had been confronted with two men armed with heavy wooden staffs, wildly bearded, no doubt seriously on the nose, mumbling in some unrecognisable language, invading his very lounge room. This was not the expected place of hospitality and refuge where we could throw our weary bodies for the night. In shock, we stumbled back on to the path. But the story doesn't end there. A hundred metres down the track we faced several hundred metres of sheer gut-wrenching climb. More Matterhorn than Camino. Forget the pilgrim staff — ice picks and ropes were needed. My companion was not happy. In between sucking in the oxygen, I began to recall with some alarm a recent conversation I had with my cardiac physician. But worst of all I was not at all sure we were going the right way. Suppose the house at the top of the hill was owned by another attack dog jealously guarding his turf. Suppose he was to hurl our weakened frames bodily down the hill. Suppose after all this life-threatening effort we had to retrace our steps and search further down the track for food and bed. I was not, as they say, in a good space. Two moments in a 15 day adventure. Two moments of blood sweat and tears — attacked by locals then attacked by the track itself. Why do I choose these two stories for great attentiveness? In a funny way because they were so atypical. There were dozens of other moments, lyrical experiences of meeting fascinating fellow searchers, finding songs to sing with people who had no common language, sharing meals that you didn't want to end, walking through vineyards heavy with fruit, contemplating starry starry nights (this was the way to Compostella 'the field of stars', after all), and experiencing the heady freedom of simply depending on your legs to take you forward. Pilgrimage is about letting go of so many of the taken-for-granted props we have grown to depend on — cars and buses and trains to carry you from one place to another; the knowledge of where you will sleep this night; the ready availability of clothes and food. The journey of a pilgrim can depend on none of these. When planning for the great Camino adventure, I anticipated long hours on the road occupied in meditation, remembering things past, reflective prayer. What I didn't anticipate was how intensely focused I would be on my body. The many hours of walking, having your feet binding you to the earth — the sheer physicality of it all. Talking about this to a young woman at the conclusion of the pilgrimage, she said: 'You pray with your feet, you know.' I never heard a better description. I even had to let go my very rational notion of prayer. 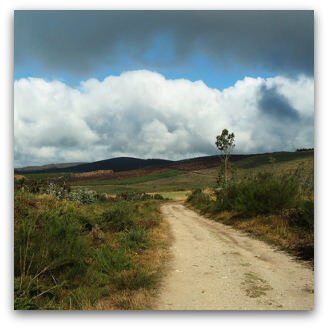 Has the Camino changed me? Yes. No. I don't quite know. Perhaps I should leave the answer to others. 'We would rather be ruined', W. H Auden claims, 'than changed'. I'm not completely sure about that. My experience is that most life-change happens in small steps. Rather like a long walk — stride after stride, kilometre after kilometre. To live is to change. And there is something about the physicality of walking the Camino which touches the essence of that slow process of change. Historically the pilgrim's lot was never easy. And it is in the difficult times that illusions can be shattered. Bodies can be stretched. The hour on the road to Alto de Poio was just such a time. It demands great attentiveness. But putting aside the question of whether genuine long-lasting change has happened or not, there are two undeniable truths which I carry locked in the memory of this small story. Never presume on warm welcome if you sport an unkempt beard and carry a big stick. And the longest hills always come to an end if your heart doesn't give out first. Post script: You will be pleased to know that there was light on the top of the hill. Our desperate climb was rewarded with cold beer, hot food and, more crucially, a bed to receive our shredded bodies. Monsignor Tony Doherty is pastor of two Sydney parishes, Dover Heights and Rose Bay. He is formerly Dean of St Mary's Cathedral and coordinator of the 1995 visit of John Paul ll to beatify Mary MacKillop. Maybe a more reliable adage is: Don't presume on a warm welcome unless you knock on somebody's front door first. I walked 850km of the Camino del Norte last year, following the death of my husband from leukaemia. After injuring my foot on the first day (by following the wrong way and walking/climbing 42 kilometres of rugged mountain pathways! ), most of my five week walk was in physical pain echoing the emotional pain. The words of a podiatrist I spoke with on my return were telling: 'it was what you needed - to heal, it’s best to walk through the pain'. Walking through the emotional pain of grieving, I found that my breathing took on a slower and deeper rhythm and that my mind was stilled, moving from innumerable questions and agonised cries around Mark’s death, to a sense of deep gratitude and even peace. You story about story makes a great yarn. Thank you for the sinew like feel you engendered as you told of the trek along the Spanish Camino. You placement of the quote from W. H Auden, ‘We would rather be ruined’ aptly describes some communities I have known, but when it comes to individuals (and pilgrims are real individuals) there is always a deep inarticulate desire to change. It so often seems that the ties of kinship can rust into bonds that would have the some vocal folk say they value so strongly the objects of values that they would rather be ruined. I only mention the aspect of community – that womb from which our social selves come forth – to highlight the freedom experienced by the pilgrim. I have walked no keys nor familiar roof on the horizon and can attest to the exhilaration of being tampered with by the unknown. We are considering a trip to Jerusalem in 2010. You story has heightened the joys and struggles this endeavour may have in store. A lovely essay. I can only say Amen to your perceptive observations of your experience. Indeed, the tough physicality and at times painfulness of pilgrimage walking - and on this, the beautifully apt comment from your fellow pilgrim, 'we pray through our feet'. And spiritual enrichment for me too came slowly, step by step and dsy by day. No blinding flash of revelation, but a slow-growing sense of peace and understanding. How precious it was to get to that level of response. and how much real work it had been to get there. Readers might be interested to know that Australia has its own home-grown pilgrimage. It takes place each year on the last weekend of October which is the feast of Christ the King in the extraordinary rite. Pilgrims walk from St Patrick's cathedral, Ballarat, to the Sacred Heart cathedral, Bendigo, s distance of about 90 km. The walk takes two and a half days and concludes with solemn high Mass in the beautiful Sacred Heart cathedral. The Christ the King pilgrimage has being going for almost 20 years. It began with about 15 walkers and now attracts a couple of hundred and rising, mainly young people. It is physically demanding but spiritually, liturgically and socially very rewarding.